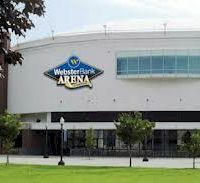 The Webster Bank Arena is a multi-purpose arena located in Bridgeport, Connecticut, built alongside The Ballpark at Harbor Yard. Events include hockey, basketball, premier concerts and special events. The Arena seats approximately 10,000 and houses 33 executive suites, 1,300 club seats and 3 large hospitality suites. The Webster Bank Arena is one of the top New York City venues for concerts and other events. Don't miss some of the biggest names in music as they come to New York City area's Webster Bank Arena to perform live.